Recently I had the opportunity to view In Death Lamented, the current exhibit at the Massachusetts Historical Society in Boston, Massachusetts. 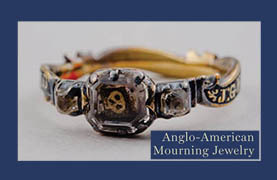 The exhibit displays 3 centuries of Anglo-American mourning jewelry. I had the pleasure of being guided through the exhibit by curator, Sarah Nehama who also happens to be this week’s guest on Fieldstone Common. 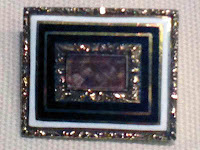 The exhibit contains two rooms full of mourning jewelry and supporting items such as paintings, embroidery and other items that further explain the story of mourning jewelry. One of the more unusual items was a tool used to braid hair into tiny braids that could be placed in mourning jewelry or even used as the rope for bracelets or necklaces. During the tour, we stopped to record Sarah speaking about the history and style of a single piece of jewelry – the Haven-Cheever Brooch. Listen to the audio clip (click play on the top of the page) to get a sense about why mourning jewelry was created. Then listen in live on Thursday, January 3, 2013 at 1pm EST to hear the full interview with Sarah Nehama. 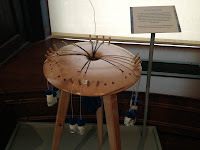 The FREE exhibit will continue at the Massachusetts Historical Society through the end of January 2013. It is well worth the trip into Boston. For those of you who live too far to visit, there is a beautiful, color companion book which features many of the jewelery pieces on display. 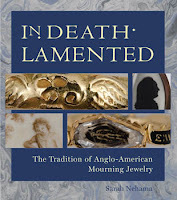 This entry was posted in Uncategorized and tagged In Death Lamented, Mourning Jewelry, Sarah Nehama, The Massachusetts Historical Society by FieldstoneCommon. Bookmark the permalink.